American Eagle Gold Coins: Are Gold Eagle Coins a Smart Purchase After All? This is the first page of historic value trends for gold Indian Head Eagles. 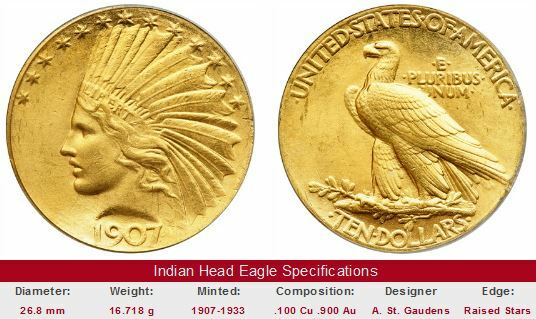 Prices from 1950 to the present for individual American eagle gold coins of the Indian Head series are reported. The data is structured to help coin collectors determine which gold eagle coins of this group have enjoyed the greatest value increases over time. You may use the links directly below to quickly navigate to the value tables of coins that interest you the most. There is one table for each and every date. We have a page devoted to the origination of this ten dollar gold coin. Beginning in 1907, the Indian Head Eagle helped elevate the image of American coinage throughout the world. You will also find a summary on which Indian Head Eagles are most likely to enjoy strong price advancements in the future. There are other value trend reports online that we offer. Go to the Coin Value Tables online report page to see what is available. You can also click the "Get Historic US Coin Values" feature in the above right hand corner to see the list of available online reports. In the 1950s, grading practices were radically different from what we have today. A coin's condition was described using simple adjectives such as "Extremely Fine" or "Uncirculated". Accordingly, numismatic references of those times conformed to the same set of adjectives to approximate retail coin values. Varying distinctions of Uncirculated (today's equivalent of MS-60, MS-61, etc) and Proof were recognized in some advertisements and auction bills by employing modifying descriptors such as "Brilliant Uncirculated" or "Choice Proof", for example. However, with no clear point of reference or consistency on how the modifying descriptors were invoked, most publishers resorted to listing values for only one "Uncirculated" grade and one "Proof" grade. The Coin Value Tables trend data for American Eagle gold coins reflect the historic availability of numeric grades to describe coins. For the 1950-1985 rows, the values in the "XF-40" column correspond to the "Extremely Fine" listing of those years, "AU-50" corresponds to "Almost Uncirculated", and so on. The "MS-60" column records the "Uncirculated" value reported during those same decades. Similarly, "PF-63" corresponds to simple "Proof" figures. Starting in the 1990 row, coin values strictly correspond to numeric grades grades. Furthermore, "Uncirculated" grades are broken down into "MS-60", "MS-63", "MS-64", "MS-65", "MS-66", and "MS-67", because by 1990 and later, this type of Uncirculated value data for American Eagle gold coins was readily available. Beginning in the 1990 row and onward, the "PF-63" through "PF-67" figures are listed for similar reasons.